We have been contacted by many people about the lead headline on the cover of the current edition of Take a Break magazine: "Poisoned by Mum's milk: Breastfeeding KILLED by baby". The headline is sensationalist - and misleading. The child had a rare genetic condition called Galactosaemia, which is an inability to break down lactose fully, making breastfeeding OR formula feeding dangerous. Galactosaemia affects an estimated 1 in 45,000 babies in the UK every year - a fact mentioned in the article. In this particular case the child was both breastfed and fed on formula at night, but it is breastfeeding singled out by the editor as killing the child. Invitation to protest at the International Congress of Nutrition, Grenada, Spain, 15 - 20 September 2013. Baby Milk Action's work on stopping corporations influencing health policies received a big boost in June this year when the Director General of the World Health Organisation, Margaret Chan, also warned: "Efforts to prevent noncommunicable diseases go against the business interests of powerful economic operators. In my view, this is one of the biggest challenges facing health promotion." She said: "In the view of WHO, the formulation of health policies must be protected from distortion by commercial or vested interests." Not everyone has got the message - and we need your help. Fast forward to September and who are the headline sponsors of the International Congress of Nutrition? 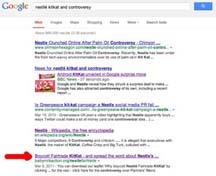 Media coverage (mentioning the boycott): Forbes, BBC, Telegraph, TechWeekEurope, Bubblenews. Industry analysis: Android KitKat: Is Nestle tie-in a PR disaster for Google? Did Google try googling for information about Nestlé KitKat and controversy before deciding to brand its new smartphone operating system as Android KitKat? 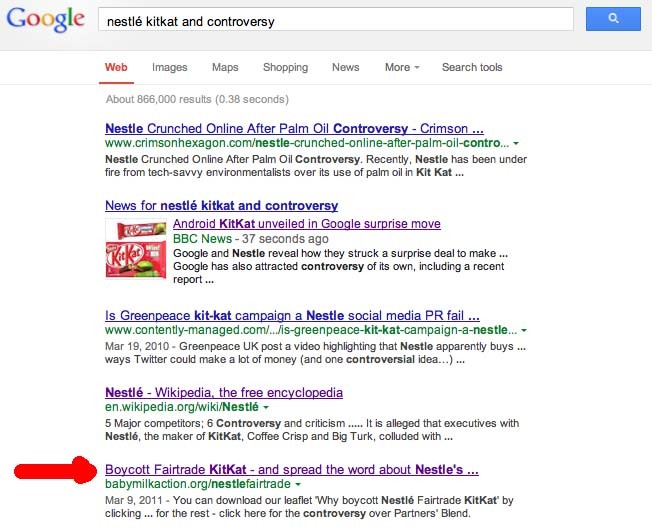 Presumably not as the first page of results turns up Baby Milk Action's page about KitKat being on the boycott list because of Nestlé pushing of baby milk (at least at the time of writing - we will be watching to see what happens to search listings following the Nestlé tie-in). Click on the screenshot left for a large version. Click here for information on the boycott. Update: Lara and Sian completed the half marathon and are pictured below with their medals. Baby Milk Action is delighted that Lara Cowpe and Sian Evans will be running in the Cardiff Half Marathon on 6 October 2013 in support of Baby Milk Action - and mothers and babies everywhere who benefit from our work holding the baby food industry to account. Baby Milk Action has been highlighting for many years that follow-on milks and so-called growing-up milks are unnecessary products. The World Health Organisation issued a new report in July 2013 restating this point. First Steps Nutrition Trust has analysed the composition of fortified milks for toddlers and warned that "the voluntary fortification of foods and drinks needs to be questioned as there is increasing evidence that giving additional nutrients to those who do not need them may have adverse consequences". Now a new report from the consumer magazine Which? has quantified the extent to which parents are being ripped off. Citing the example of Nestlé's SMA milks, Which? says parents could save £531 by using cow's milk instead of SMA-branded toddler milk, with nutrients such as iron coming from other foods that should be introduced from the age of 6 months in any case. Should Kate breastfeed? It's none of our business. Here's what is our business. Kate, Duchess of Cambridge, has not yet given birth and people are telling her how to care for her child. The Guardian reported yesterday that a TV presenter had "called upon the duchess to become an advocate for breastfeeding." It is enough to have advice coming from all sides from family and friends, without trying to satisfy the demands of a nation, particularly with regard to one of the most immediate, fundamental and intimate aspects of nurturing the precious new-born gift when it arrives. I don't think it is our business how Kate or any mother feeds her child - but there is plenty we can be doing to ensure that mothers have the support they require and deserve. 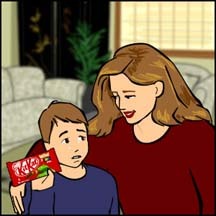 In fact, it would be great if the energy and media attention expended on offering unwanted advice to Kate was applied where it is really needed: protecting the right to accurate, independent information for mothers, stopping misleading promotion of formulas (such as the "What's the best milk after Kate's?" formula advertising campaign), ensuring mothers who do use formula have information on how to reconstitute it properly and allowing mothers to breastfeed, instead of consigning them to toilets to do so. Nestlé has entered the UK formula market and aggressive marketing practices - and underhand tactics - familiar to those monitoring its practices around the world are now being seen here. Nestlé booked the Royal College of Physicians (RCP) for an event targeting health workers on 9 July 2013 under a different name, Baby Milk Action was told, otherwise the RCP would not have accepted the booking. Baby Milk Action handed out leaflets on conflicts of interest to those arriving for the event on obesity in pregnancy and infancy. The next event in the series, scheduled for 11 July in Birmingham, is today shown as 'cancelled' on Nestlé's site promoting the events. Danone is stepping up its targeting of health workers and the public, in violation of international baby milk marketing standards. In the UK Danone's formula brands are Aptamil and Cow & Gate. Baby Milk Action is organising protests where possible to raise awareness of the conflicts of interest involved in having a formula manufacturer and distributor as a sponsor and prompt a debate. Baby Milk Action has been contacted repeatedly about two events being sponsored by Danone in the UK in coming days: Tommy's baby race on 30 June, promoting the Cow & Gate formula brand, and a Royal College of Midwives training event on 11 July. Baby Milk Action is highlighting how these strategies violate marketing requirements and is calling for an open debate on sponsorship and conflicts of interest. These events follow Nestlé's entry into the UK market, which has seen more aggressive marketing practices, driving down standards for the industry as a whole. At present Nestlé is targeting health workers around the country, trying to entice them to events at hotels. Baby Milk Action is organising protests outside these events - click here to find an event near you.